Naja Productions is proud to present the documentary Metal of Honor, which chronicles the incredible account of the courageous New York City ironworkers who risked their lives following the tragic events of September 11th. Their story is largely untold, but the rescue and recovery efforts at the World Trade Center after the 9/11 attacks would not have been possible without these men. Naja Productions’ president and founder Rachel Maguire produced and directed Metal of Honor, gaining exclusive access to the men of the Structural Ironworkers of New York City Local Union 40. Maguire licensed the documentary’s North American rights to MTVN’s Spike TV in Spring 2006. With eighteen years of television experience in a variety of formats ranging from long form to news to verité, Maguire feels privileged to have the first opportunity to sing the praises of these unsung heroes. 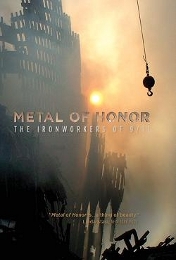 Metal of Honor is a powerful and poignant documentary that takes viewers behind police lines to witness the events at Ground Zero through the eyes of the structural ironworkers from New York’s Local 40, who toiled with manic dedication at the site. With no narration, the story is told through compelling personal interviews with the men who battled through the war zone haze of ash and rubble. They describe both their triumphs and their sorrows in intimate and harrowing detail. Armed with cutting torches, they risked their personal safety to burn through steel, clearing paths for equipment and emergency personnel. As fires burned in the pit below, the workers navigated the constantly shifting and dangerous terrain in search of survivors. Traumatic images still haunt their dreams; the smell never leaves their memories. Many suffer from post-traumatic stress disorder and respiratory problems. Never seeking attention for their sacrifices, they are proud of their contribution. Metal of Honor is their story, in their words — a story of human spirit, camaraderie and passion. Metal of Honor features an original score composed by Emmy Award-winning Michael Bacon of the folk-rock band The Bacon Brothers. The documentary was shot 16×9, 24p on the Panasonic SDX900A by Director of Photography Gregory Andracke. Lincoln Alabaster serves as Spike TV’s Executive in Charge of Production.